← You can look like a hero or a fool when you choose a caterer! 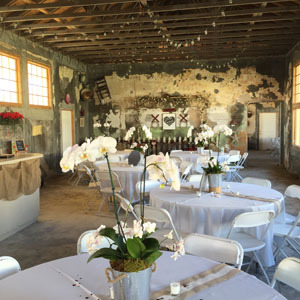 Smoke & Spice had the privilege of catering the founder dinner at the 100 year old Redland Farm Life Center building on February 13th for 250 guests. To read more about the facility’s history and plans for the future read this article from Edible South Florida. The decorations at the event were provided by Susie and Tim Ebersole. Their creativity and charm created a backdrop that made the building come to life! Steve and Ethel Hurst for the assisted with lights and DJ Leroy provide the the music, some lighting and electricity! The Dade County Women’s committee was the instrumental group along with the South Pioneer Museum members and many volunteers that helped prepare the cleanup!